On the occasion of the anniversary of the cession of the disputed Kampuchea-Krom land to Vietnam in 1949, nearly 2000 Buddhist monks will gather to commemorate one of the key events that led to a long-lasting repression of the Khmer-Krom people, particularly towards the religious practitioners who are wrongly seen by the Vietnamese authorities as a threat to their influence. This gathering coincides with the Khmer-Krom conference co-organised by the UNPO and its Member, the Khmers Kampuchea-Krom Federation, on 2 June 2018 in Paris. The conference will draw attention to the numerous human rights violations to which their people are exposed. The article below was published by Khmer Times. Three Khmer Kampuchea Krom associations are planning to host a religious ceremony in Phnom Penh next month [June 2018] to mark the anniversary of the cession of disputed ethnic Khmer Krom land to Vietnam in 1949. 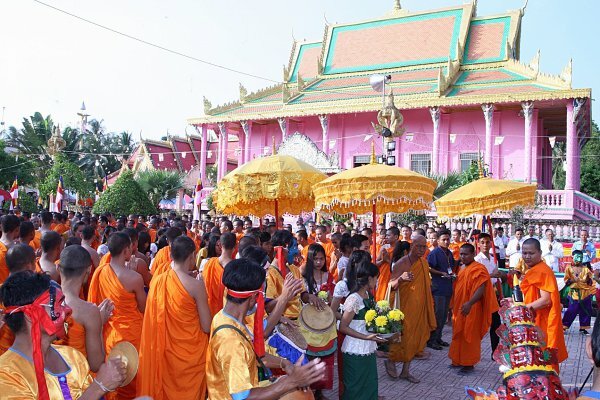 Thach Setha, executive director of the Khmer Krom Community and chairman of the ceremony committee, said yesterday [23 May 2018] that the ceremony will draw 2,000 participants, including 1,949 Buddhist monks, to commemorate the year of the cession. Mr Setha said that the opening ceremony should be held in public and added that that the government should make June 4  as a new national holiday. Tim Thy, a Phnom Penh resident who attended past events, said that the government should designate June 4 as a holiday aimed to boost a sense of nationalism. “If I have the time, I will also join this year’s anniversary,” he said. On Monday, three organisations, including the Khmer Kampuchea Krom Community, Khmer Kampuchea Krom from Human Rights and Development Association and Khmer Youth Alliance for Democracy, submitted a letter informing City Hall of their plans. City Hall spokesman Met Meas Pheakdey could not be reached for comment yesterday. In June 1949, France relinquished control of land considered part of Cambodia to Vietnam. About 70,000 square kilometres passed through foreign hands.